On building sites all actions regarding security and possibilities of climbing must be adapted steadily to the different situations due to the progress on site. 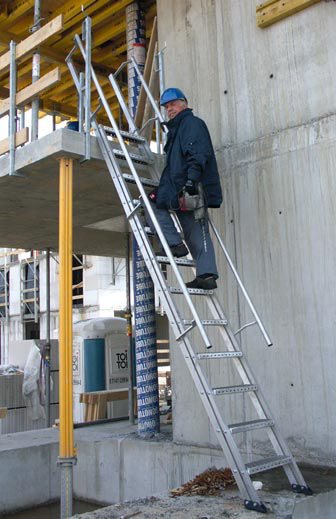 The use of ladders or self mounted wooden staircases may seem to be safe. The building authorities noted in building construction approx. 9000, partly very heavy, accidents with ladders. In industrial branches even approx. 26.000 accidents were noted in 2007. 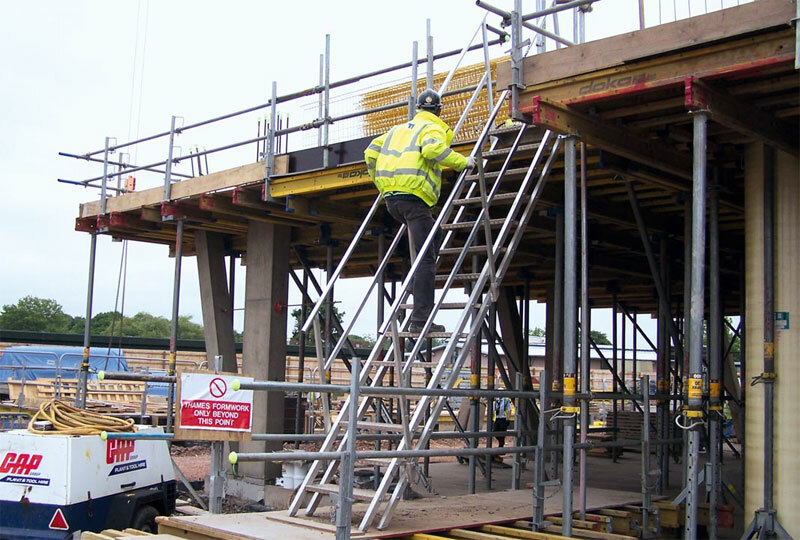 Yet not always scaffolding, stair towers or working platforms can be used as a safe alternative possibility. When a safe and secure stand or hold is not possible while transporting items and working equipment on site, the danger of a fall is high. 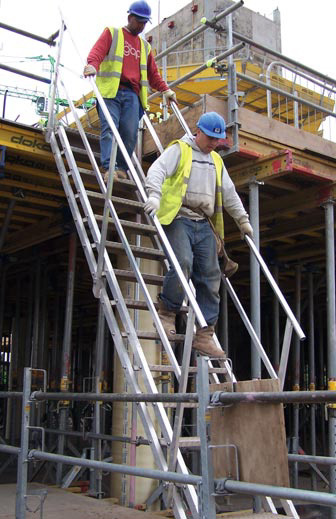 With the development of our staircases and ladders, available in two different lengths, with horizontal stairs and guard rail, we have defused these risky situations. The steps and stairs will adjust themselves always in a horizontal position because of the approved parallelogram shifting of the longitudinal girders, independent of the obliquity of the staircase or ladder. 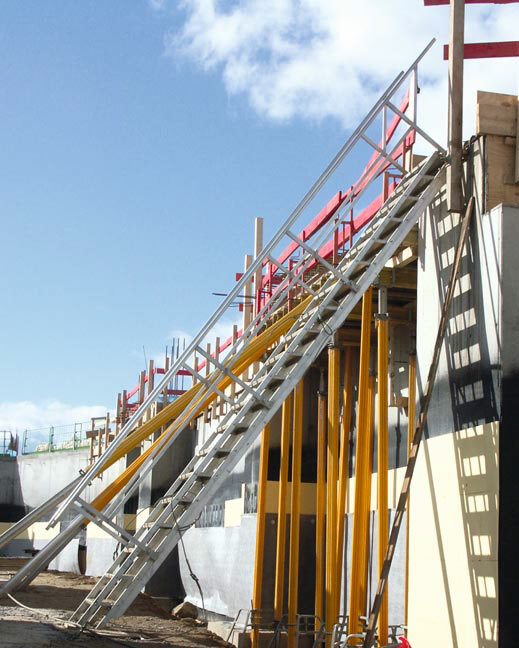 A safe and comfortable stand, and with the guard rails also a secured hold, is always guaranteed. 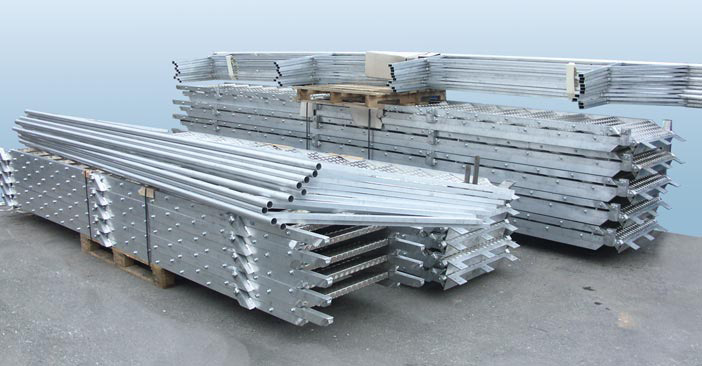 For a safe overcoming of different levels during construction stages and to ease all working processes, also for the transport of equipment from floor to floor.